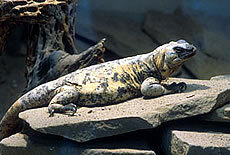 The San Esteban chuckwalla is only found on the Islands of San Esteban, Lobos, and Pelicanos in the Gulf of California. They are large, plump lizards that reach about two feet in length as adults, and they have loose folds of skin around their neck and shoulders and thick blunt tails. Their skin is gray with tan to yellow patches over their entire bodies, and their faces are gray to black. Females are duller in appearance with less patches. Their colorations provide almost perfect camouflage against some of their predators. Chuckwallas prefer deserts with open flats and rocky areas for their habitat. The areas typically contain creosote bush and other drought-tolerated scrub. They are active only in the day and spend much of the morning basking in the sun. They feed on leaves, fruit and flowers of plants, and insects. They are not harmful to humans and are known to run from potential threats into tight rock crevices where they inflate their bodies to become entrenched. Males are territorial and have glands under their legs that they use to mark their scent. Mating occurs from April to July, and females lay 5 to 16 eggs between June and August. The eggs hatch in late September. These lizards are known to live over 25 years. This species is threatened because of its rarity and slow reproduction rate, and because it closely resembles the poisonous gila monster species, and as a result, some are killed mistakenly by humans. 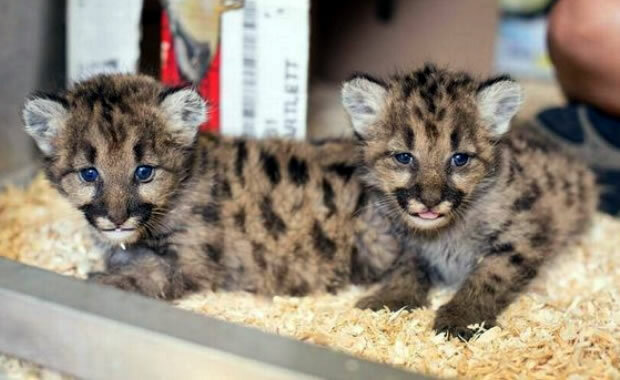 Other threats to the species include habitat disturbance and capture for the pet trade. This species was listed as endangered on March 20, 1989, and there are no other known conservation measures being taken to preserve the species. Copyright Notice: This article is licensed under the GNU Free Documentation License. It uses material from the Wikipedia article "San Esteban chuckwalla". Glenn, C. R. 2006. "Earth's Endangered Creatures - San Esteban Island Chuckwalla Facts" (Online). Accessed 4/20/2019 at http://earthsendangered.com/profile.asp?sp=73&ID=9. Need more San Esteban Island Chuckwalla facts?